Mr. Sine Chadi is known for his hospitality and philanthropic commitment to charitable organizations that benefit Edmontonians. Raised in northern Alberta, Mr. Chadi has bore witness the struggles and temptations that face youth with disproportionate opportunities to their peers. 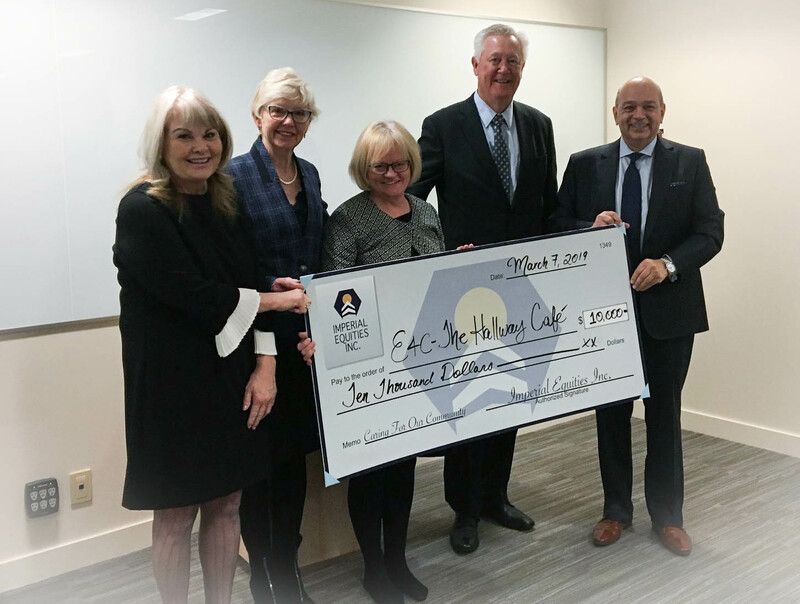 A longtime supporter of the Hallway Café, formerly Kids in the Hall Bistro, and this year’s Presenting Sponsor of the Kids in the Hall Gala, e4c chatted with Sine about his commitment to the social enterprise, and how his involvement came to be. Looking back to 2007 or 2008, Mr. Chadi was approached by a friend, who was looking for an auctioneer to run the Live Auction portion of the Kids in the Hall gala. While he is not an auctioneer by trade, he has been offering his services to Edmonton charitable events for over 20 years, fundraising for not-for-profits in Edmonton and throughout Alberta. After attending that first event, and hearing firsthand the impact of the programming on the youth supported, Mr. Chadi was enraptured. Since then, he has been a staunch supporter of the Bistro and now, the Café, first handling the auction portion of the event, and evolving into a Platinum event Sponsor. Well-known in charitable circles for his generosity and corporate citizen, he notes that his involvement with the Hallway Café Gala grew and evolved into where it is today, because he saw some event planning gaps from an attendee perspective. Knowing that he could do more, and provide more than a donation, but his insight and time, Mr. Chadi now hosts the event, and acts as the event committee chair, a role he hopes that his son will take over next year. Mr. Chadi laughed at the thought of cutting back and handing his son the reins. After all, he used to do 100 events each year, and now he only does “about twenty,” adding that he would sometimes do two in a night. Speaking on the Hallway’s transformation firsthand, Mr. Chadi reflected thoughtfully, and shared a story about respect and respecting one’s property. Noting that the transformation was essential to continuing to operate, Mr. Chadi shared one of the top tips for success – the need for a respected and appealing property. After all, he has made his mark on Alberta through Imperial Equities, a company that focuses on the acquisition, development, and/or redevelopment of real estate assets. Referencing the transformation, Mr. Chadi thoughtfully noted that e4c had put together a strong team of people, but we needed more than that; we needed a transformation, and a venue that demanded respect. Reflecting, he speaks of an Esso station he acquired, which had many problems for years, particularly in the bathrooms. It was off a busy highway, and frequented with travellers – and graffiti. After years of cleaning up, repainting, and fixing the disrepair in the bathrooms, Mr. Chadi decided that enough was enough. The washrooms were brightened, repainted, and fixtures, particularly large, rather ornate mirrors, were hung on the walls. Miraculously, graffiti became virtually nonexistent. Laughing, he remarks that “even the paper towel was no longer on the floor – it was in the wastebasket.” This was because the ambiance that was created was elevated, and demanded respect. Speaking of great food, Mr. Chadi works alongside the Hallway Café culinary team to develop the menu featured at each event – he likes the idea of something different, outside of the event norm of rubbery chicken and greens. Game meats have been a feature in the past, with this year being no different. Enjoy a delectable four-course meal with a bison main, prepared entirely by the Hallway youth. Thank you, Mr. Chadi and Imperial Equities, for your insistence that “you have to be a little different,” when approaching fundraising and special events. Your continued support will enable more youth than ever before to access essential programming and educational services. See you on April 11th!